V8 Ute Rookie of the Year contender Rhett “Rev Head” Noonan is pumped for action on home turf when he takes to the track for Round 3 of the Auto One V8 Ute Racing Series – protected by Armor All – at the Chill Perth 360 at Barbagallo Raceway from May 3 to 5. The former Formula Ford driver is hoping his home round won’t be the end of his 2013 V8 Ute Season campaign. “I’m looking for a bit more help to get me through the rest of the year,” Noonan said. “Ben (Dunn) said I can continue in his Ute if I can support myself. The Piara Waters local is currently steering V8 Ute Veteran and former Waratahs Rugby Union Player Ben Dunn’s Ford, and although the V8 Ute Board Member would love to race this season he’d be happy to keep the Ute available to the youngster. Noonan’s car is run by Sieders Racing, which has a long-line of Rookie champions in the team including 2012 runner-up David Sieders (2010 Rookie), Andrew Fisher (2007 Rookie) and the team will also be joined by 2008 Rookie of the Year, Glenn McNally for the Perth Round. 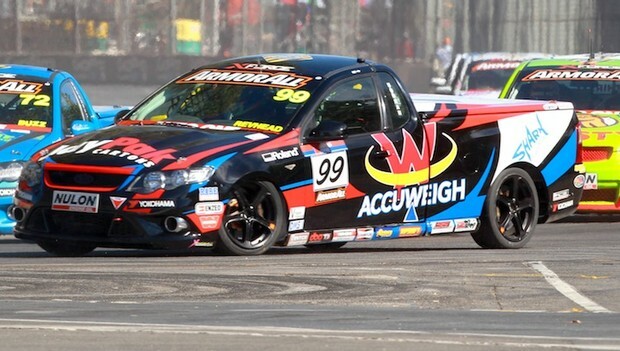 Nineteen year old Noonan is the youngest driver in the Series – three months shy of fellow Rookie and West Aussie Adam Marjoram – and is currently running fifth in the V8 Ute Rookie fight, only 66 points behind current leader and Sieders Racing Teammate Elliot Barbour. Noonan was unlucky to have a DNF in Race Three at Adelaide, due to contact from Noel Edge at turn one off the start. Richard Bloomfield was also caught up in the incident and was unlucky to clip Noonan, damaging the front end. Noonan is testing with the Sieders Racing Team tomorrow at Sydney Motorsport Park and will hit his home track on Friday May 3 for two practice sessions before the races over the weekend.